Volume 17 | Qioptiq | Qioptiq: "Stand in Line for Improved Capability"
Qioptiq: "Stand in Line for Improved Capability"
KITE In Line. Photo: © Qioptiq. The roadmap for enhanced Surveillance, Target Acquisition and Engagement is becoming increasingly interesting as a number of national soldier modernisation programmes are now looking at refreshing system architectures and looking at what technology developments can be used to refresh soldier system capability. The scene is firmly set for the 2015 – 2020 period where we will see significant enhancements in sighting system capability through technology evolution and deeper integration with weapon and soldier systems. Qioptiq continues to push the boundaries of Weapon Sights & Surveillance Equipment for DCC users with some significant product and technology development activity planned for the 2015 – 2020 period. Qioptiq has recognised the recent shifting trend to the In Line configuration, which gives the User the ability to retain his conventional optical day sight, and therefore retain the zero and other MMI settings that the User is familiar with. 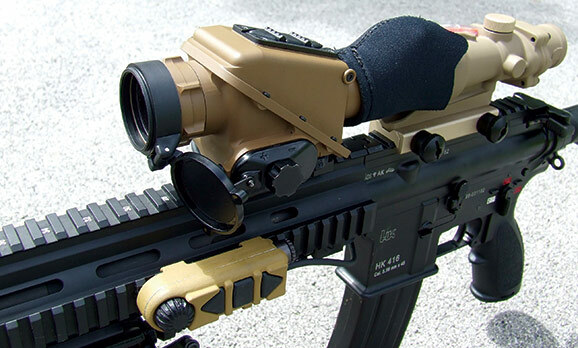 With a range of technologies including Image Intensified, Thermal Imaging and a combination of both in the newly developed SAKER blended weapon sight, Qioptiq have products to suit a wide range of user groups and weapon systems. Providing the User with an In Line “Clip On” night vision capability, the KITE IN LINE sight is proving very popular with current KITE customers, who want to transition to the In Line configuration and re-use existing KIT components, and new customers who want a light weight, robust and high quality night vision capability for assault rifles and sharpshooter weapons. KITE In Line is a very compact optical design that can be fitted with a range of Image Intensifier Tubes, with the possibility to utilise customers tubes fitted to other older equipment, such as the Qioptiq KITE sight, which means that a customer can re-utilise existing tubes and therefore reduce acquisition cost of the in line capability. KITE In Line has been designed to be compatible with a wide range of optical day sights produced by the world’s top manufacturers, and is compatible with both Picatinny and NATO accessory rails. Since its Launch in 2013, and building upon the success of the original KITE family, the KITE In Line is proving a popular sight with customers around the world. Alongside the KITE In Line, the DRAGON Compact Thermal Imager (DCTI) has been given a technology refresh and is now available in a 640x480 17um sensor format, along with other upgrades including a focusable objective lens to enhance close range focus, an Infra-Red Laser Pointer to allow target indication, and on board image capture & storage to support target data collection and dissemination amongst users. Powered from just 2 AA Lithium batteries, the DCTI will provide over 5 hours of operation. 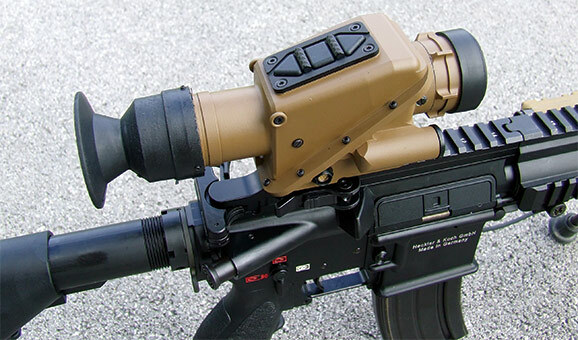 An intuitive Man Machine Interface (MMI) means the DCTI is easy to operate with all features available to the user via 3 buttons located on the sight unit, or via a remote control unit that can be mounted to the Users weapon system to allow control of the DCTI from a comfortable observation / firing position. DCTI gives the User a flexible means of providing thermal imaging capability that can be distributed around the squads in order to maximise the effect of thermal imaging alongside conventional night vision. 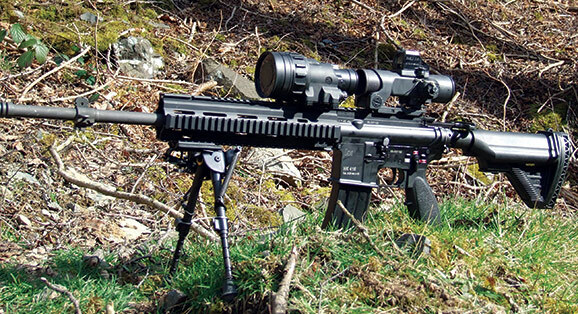 DCTI is rugged and offers excellent boresight stability when utilised on 5.56mm and 7.62mm assault and sharpshooter rifles and provides the User with the ability to detect man sized targets at ranges over 1000m in all weathers and zero light levels. For a number of years the Dismounted Close Combat (DCC) community has been proposing, discussing and developing concepts to enhance sighting system capability through the provision of multiple wavebands in a single sighting system. Commonly referred to by a number of means, including integrated, blended or fused, the objective is to provide the User with more than one sensor so that the target scene can be viewed in different parts of the Electro Magnetic (EM) spectrum simultaneously in order to extract additional information to enable enhanced DRI in a reduced time. Qioptiq have been at the forefront of blended weapon sight development for the past few years, which have recently culminated in the development and launch of the SAKER blended weapon sight for Assault Rifles and Sharpshooter weapon platforms. SAKER combines conventional Image Intensifier with uncooled thermal imaging in order to provide the User with a blended image that can be adjusted to suit the target scene conditions. Qioptiq have spent a significant amount of time and effort developing and refining the control architecture and Man Machine Interface (MMI) in order to ensure that the SAKER sight is simple to operate. Providing an intuitive control architecture that avoids increasing the cognitive burden of the User is paramount for this type of sighting system, as the User will not be able to optimise the benefits if the sight is complex to operate. SAKER delivers a blended capability in an ITAR free package, using a standard 18mm Image Intensifier Tube such as the PHOTONIS INTENS, which means high performance imagery is combined with the sensitive thermal imager. SAKER has been qualified on a number of weapon platforms, and is currently undergoing assessment and evaluation by a number of NATO countries who are looking to equip their Users with blended sight capability in a lightweight, compact and robust package that is easy to operate. 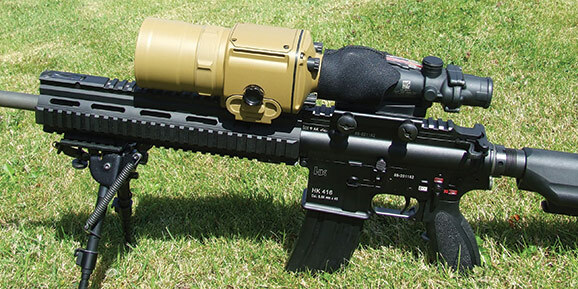 SAKER represents the first in a line of “next generation” sighting products to be released from the Qioptiq fold, with a number of exiting product developments scheduled for release during the 2015 – 200 period to ensure that Qioptiq has leading edge products to offer our customers around the world. Qioptiq have continued to support the UK MoD / DSTL Development of the Weapon As A Platform (WAAP) concept being delivered under the Delivering Dismounted Effect (DDE) programme which is being delivered by an Industrial consortium led by System Engineering & Assessment (SEA). Qioptiq has continued to strengthen its research & development capacity and are undertaking some interesting work packages looking at Digital Optical Weapon Sights (DOWS), Augmented Weapon Sights and Integrated Power & Data connectivity within the WAAP Technology Demonstration Programme. The potential is certainly there, but as with any “revolutionary vision”, there are a number of gremlins lurking in the shadows that need to be attacked and overcome, and these things take time. From our experience it can be anything between 3 – 7 years (and considerably longer in some cases) between Industry coming up with a “good Idea” to the capability actually being deployed with Users on Operations, with the road in between often involving multiple development / refinement cycles and a lot of patience………. 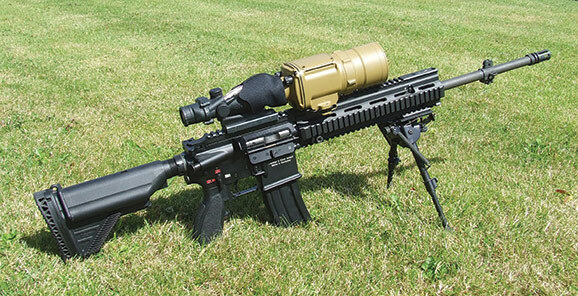 It’s widely recognised that modern small arms weapon systems are incredibly accurate and reliable, and that the challenge is being able to Detect, Recognise, Identify (DRI) and engage targets 24 hours a day, through all weathers and battlefield conditions, with Users under physical and cognitive pressure. 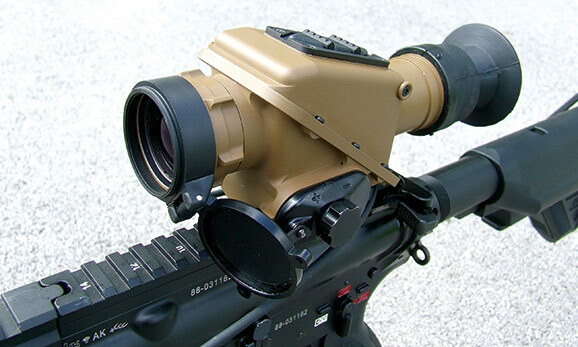 The future is digital, and Qioptiq has continued to move forward on the development of Digital Optical Weapon Sights (DOWS), with as number of projects looking at specific aspects including the integration of fire control information and a modular architecture to allow the User to tailor a host sighting system in order to meet his specific mission need.